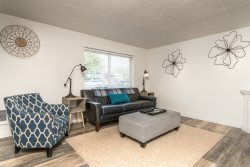 600 sq ft ADU, rental on the East Side of Bend, OR, furnished, classic modern. Green House and off-street parking. Month to Month. Near St Charles Hospital and the medical district. Quiet dead end street. Great little ADU on the East side of Bend, OR, nestled in a quiet neighborhood on a dead end street. This little house is fully furnished in classic modern style. It has solid surface flooring throughout for easy clean-up. The kitchen has all new appliances with a gas range and eating bar. There is room to entertain in this 600 square foot space! This space is perfect for the low maintenance life. There is even a 6x8ft green house, ready for you to plant your favorite vegetables and flowers.